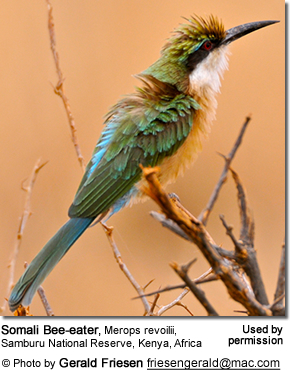 The Somali Bee-eaters (Merops revoilii) are small African bee-eaters - so named for their favorite prey: bees. Their range stretches from Somalia east into southeastern Ethiopia, west to Saudi Arabia, and south to northern and eastern Kenya (west of Lake Turkana south to Tsavo National Park) and Tanzania. They prefer dry country and desert areas; and are usually seen alone or in pairs (during the breeding season). The Somali Bee-eater is the second smallest Bee-eater after the Little Bee-eater. It only measures 6.3 - 7.1 inches (~16 - 18 cm), including the tail. This bee-eaters is mostly green above, except for a blue rump, reddish-brown forehead and blackish bar that extends across the eyes down to the sides of the neck. The plumage below is cinnamon. Somali-beeaters feed primarily on bees, but will take other small flying insects - depending on availability of prey and season. Insects are often caught in flight with short dashes from low perches. Somali Bee-eaters mostly breed between March and June. They usually nest in the sides of deep wells; they may dig holes in cliffs or banks of earth. They usually nest in small colonies that comprise family groups, known as "clans". Non-breeding adults or immature birds participate in raising the young of other members - something that is commonly referred to as "co-operative breeding." The calls are described is deep squeaks.